Poll: Has Donald Trump been a good president for the US? Trump has historically low approval ratings but a fiercely loyal base. 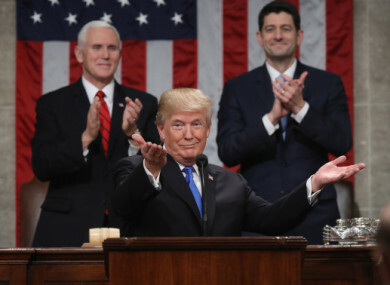 S president Donald J Trump delivers his State of the Union address in the chamber of the US House of Representatives 30 January, 2018 in Washington, DC. US PRESIDENT DONALD Trump delivered his first State of the Union address last night. Trump congratulated himself for helping to improve the American economy and declared himself a champion of the American worker. The president heralded “a new American moment” in his address. He spoke about a bounce in the stock market and the need for much tighter immigration controls to improve domestic security. Trump has a historically low approval rating for a US president, with polls putting his support at 40%. However, he inspires fierce loyalty in his base, with many Americans satisfied with the job he is doing. After a year of political disputes, attacks on the media, investigations into Russian interference, growing numbers of jobs and an improving economy, the question is whether Trump is doing a good job. Today we’re asking: Has Donald Trump been a good president for the US? Email “Poll: Has Donald Trump been a good president for the US?”. Feedback on “Poll: Has Donald Trump been a good president for the US?”.